Thoughtful and evocative, this new video addresses the complex issues surrounding end-of-life care for children. Psychologist and award-winning filmmaker Leora Kuttner, PhD, profiles five children with life threatening illness, and the families and health professionals who support them. The film clearly shows that, despite popular belief, children can talk about end-of-life issues if given proper support, and that doing so can help both them and their families cope with the realities of their situation. The film focuses on the emotional and psychological aspects of pediatric palliative care. It features deeply caring physicians, nurses, therapists and others working with families whose children range from newborns to teenagers. 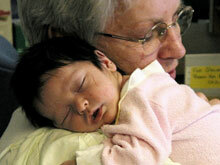 Their care takes place in the hospital, in hospice programs and at home. Designed for health and social service professionals and students, this program is also compelling viewing for families and anyone caring for seriously ill children, as well as for the general public. Silver Award, Health & Science Communications Assn. Two extraordinary women, diagnosed with end stage cancer, are facing death head on, determined to lead richer, more rewarding lives in the time that they have. This three-part series deals with end-of-life care and decision making in the hospital, through profiles of several severely ill patients and the staff who deal with them. A powerful and evocative series of short, one-character dramas created by two nurse-educators, and designed to focus discussion on complex ethical issues in end-of-life care.